I’m telling you… the jury is definitely not out on these chocolate covered almonds. They are fabulous. This recipe is a win-win-win. (Yummy, healthy, and super crunchy!) Makes 2 cups. 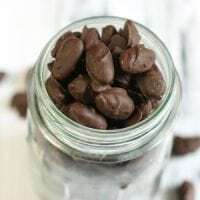 4 ounces sugar-free chocolate chips no-sugar stevia-sweetened chocolate chips without any fillers! Melt the chocolate chips in a double boiler or a bowl placed inside a pot with some boiling water. Add the almonds to the bowl of chocolate. Mix well to coat all pieces in chocolate. Using tweezers (I’m using the ones that came with my serger ;) ) or a fork, transfer the almonds one by one onto the baking tray so they’re not touching. Put the tray in the freezer for about 5 minutes to set the chocolate. Transfer the chocolate almonds to a pint size jar and tighten the lid. Try not to eat them too fast! Enjoy! Learn how to soak and dehydrate the almonds in this free video series.